Kicking Sand in One's Face . . . I was coming home one night from a movie and saw a local high school football champ and his friend up ahead. I jogged up to them and soon the friend of the 'hero' started pushing me around, calling me names, etc. I was 13 and these guys were seniors. I ran home, shaking … opened up my comic magazine to the page about exercise, Charles Atlas and George Jowett. I took my measurements, started training, and have been doing it ever since that night — over 60 years ago! 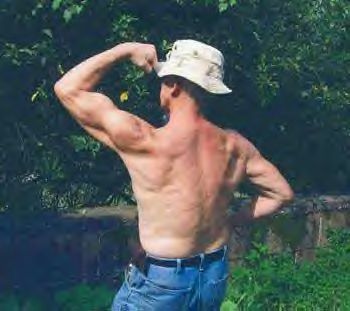 I train every day, from 45 min to 1.5 hrs… have a home gym … use free weights and cables … and feel terrific! I have recently been a trainer at the local senior center where they have a well equipped fitness room. I eat what I like but never after 5 p.m. … have a touch of vino … I’m a daddy of seven and granddad of eleven. I am in heavy training for next year. Next year is always my motivation. The bully that allowed his friend to mug me was honored at a sports affair a few years back. I was going to tell him off, but he looked like a skinny ole goat in his wheelchair, and I just shrugged it off. I really wanted to belt him though! It’s all self-discipline and pride. Comments for Kicking Sand in One's Face . . .
Wow… This is incredible. It was hard for me to digest the fact that this guy is actually a 70 old one. Just look at the shape of his muscles, it is incredible. We can’t point about the tone of the body, as skin tends to sag in this age. I am 48 and I still have a great shape. I work out just 20 minutes a day and jog for an hour. This has helped me keep my heart healthy, my body is light, and I feel great. Running is always the best exercise. Great story Nino! I too remember those Charles Atlas ads back around the mid 50s or so (I'm 68) You never know when a negative experience will turn into a positive one. I understand why you wanted to tell that bully off but I'm thinking it would have been better if you thanked him for making such a positive influence in your life. Especially since he was such a wasted away nothing. Nice going for not ripping him a new one though. LOL Keep up the good work! I too exercise just about every day and love it.